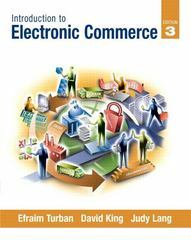 Introduction to Electronic Commerce 3 Edition Explore the essential concepts of electronic commerce. Written by experienced authors who share academic as well as real-world practices, this text features exceptionally comprehensive yet manageable coverage of a broad spectrum of EC essentials from a global point of view. The third edition pays special attention to the most recent developments in online behavior in our business, academic, and personal lives.